Carrie Fisher, in character as General Leia Organa in 'The Last Jedi,' wearing dramatic earrings, a ring and bracelets Photo © 2017 Lucasfilm Ltd. There is jewelry and gems from beginning to end of the two and half-hour long epic. 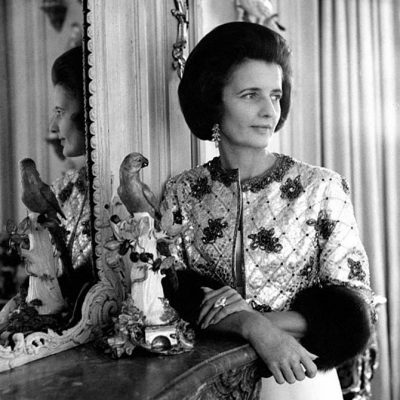 The story delves into a variety of meanings for jewelry and was amazing to watch for this jewelry journalist. General Leia Organa (Carrie Fisher) wears dramatic earrings in ‘The Last Jedi.’ Photo © 2017 Lucasfilm Ltd.
For Carrie Fisher’s General Leia Organa, there is a long history of her having great hair and great jewelry. In the 1977 Star Wars: A New Hope, the Princess put on pieces from Finnish designer Björn Weckström that George Lucas himself sourced, for the final scene. The cool jewels Leia wears in The Last Jedi appear to have been made by the prop department. 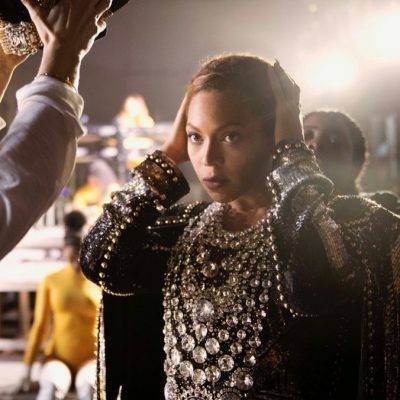 I believe this to be the case, because some of the jewels look like the pieces she wore in The Force Awakens and no designer has claimed those jewels since that movie debuted in 2015. Plus there is precedent for prop masters making jewelry for science fiction films. Read my interview with the Andy Siegal, the prop master of Star Trek Beyond here. As for the meaning of the jewels, there has been speculation that the dramatic ring with two blue lapis-style stones in an Arts and Crafts swirl is her engagement ring from Han Solo. This is unlikely, mainly because she is wearing it on her right hand. She does have a ring with a gem that looks like an opal on her left hand in The Last Jedi. If they still follow the old-fashion rule that, that finger is the finger in space, it certainly could be her engagement ring and a way of holding on to Han’s memory. Leia’s other jewels are from her stylish royal collection. She may be a Rebel, but she is still nobility. Her most eye-catching pieces are the gold-tone earrings that wrap around her lobes. Vice Admiral Holdo (Laura Dern) wears dramatic jewels and hairpiece in ‘The Last Jedi.’ © 2017 Lucasfilm Ltd. 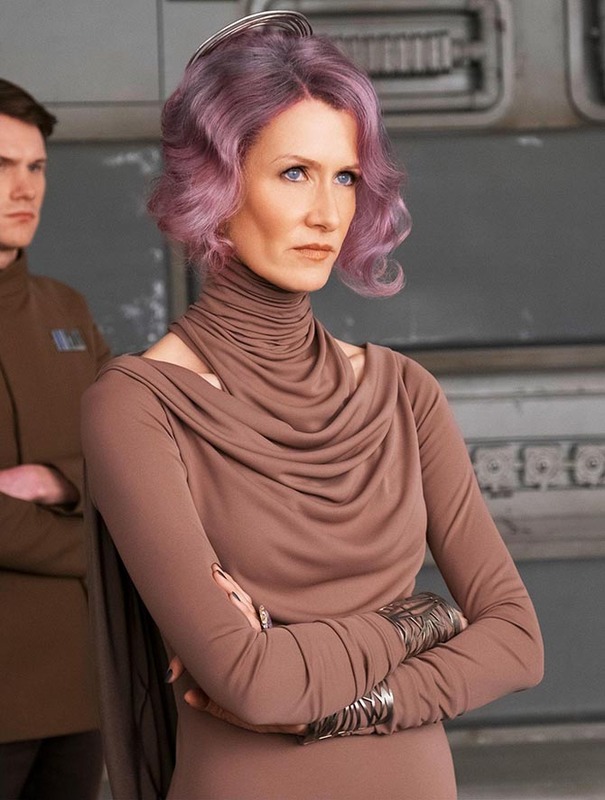 The theme of powerful women beautifully dressed in powerful jewelry extends to Vice Admiral Amilyn Holdo (Laura Dern). She has some stunning openwork cuffs, slender pendant earrings and a big hair accessory that she wears with her flowing dress and violet hair as she commands a ship. 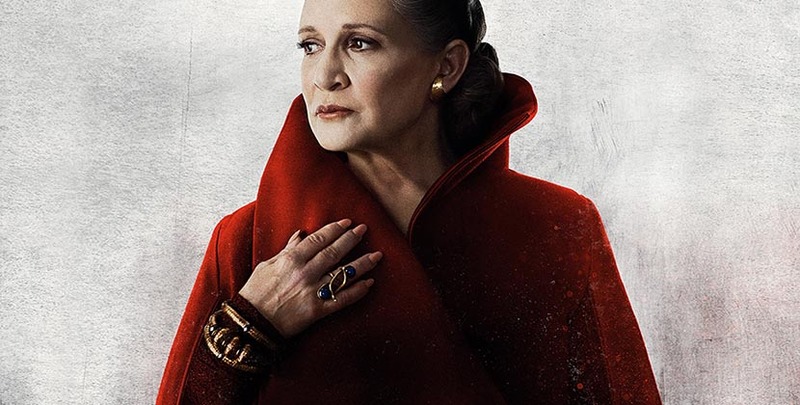 The jewels have an Arts and Crafts vibe like Leia’s accessories, but they are silver-tone and more geometric. According to Screen Rant the patterns on the cuffs represent the constellations as seen from her home planet Gatalenta. 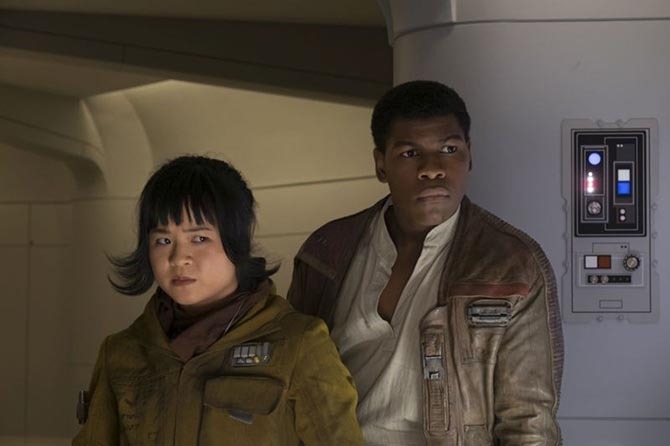 In a scene from ‘The Last Jedi’ Finn (John Boyega) is with Rose (Kelly Marie Tran) who is wearing her necklace. A glimpse of the chain can be seen between her coat and scarf. Photo © 2017 Lucasfilm Ltd. The necklace worn by Poe Dameron (Oscar Isaac) never plays into the plot, but it has been revealed in The Last Jedi: The Visual Dictionary that the wedding band strung on the chain belonged to his mother, Shara Bey. He is saving the jewel for the right partner. Rose also wears a ring with a secret compartment that reveals the symbol of the Rebel Alliance. The graphic shape is a starbird, that has been part of Star Wars films in different costume elements such as the helmets of X-wing pilots. The symbol is a critical sign to show strangers Rose is a Rebel. An interesting fact for film buffs: In the Humphrey Bogart classic Casablanca (1942), a member of the Free French Forces has a ring with the same type of mechanism. It slides open to reveal the Cross of Lorraine a symbol of the anti-Nazi organization. 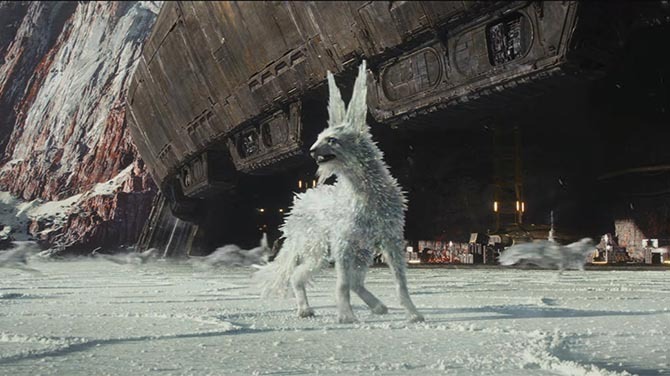 In ‘The Last Jedi’, the Vultpex foxes on Mineral Planet have coats of rock crystals. Photo © 2017 Lucasfilm Ltd.
A secret Rebel base in The Last Jedi is located on Mineral Planet. It has been seen in the trailers where the white surface turns to red salt when ships fly across it. The Vultpex foxes that live on the planet have coats made of rock crystals. There is even a scene in the film when the Millennium Falcon flies through a cave covered in red crystals. 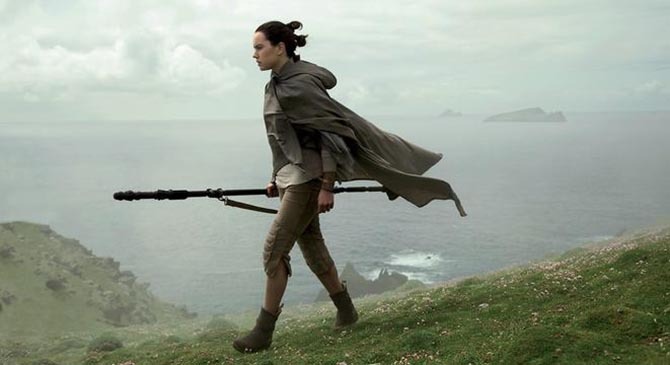 Rey (Daisy Ridley) on Luke Skywalker’s secret island in ‘The Last Jedi.’ © 2017 Lucasfilm Ltd. While the young Jedi Rey (Daisy Ridley) doesn’t wear any jewelry in the movie, she does wear a tracking device that sort of resembles a watch. 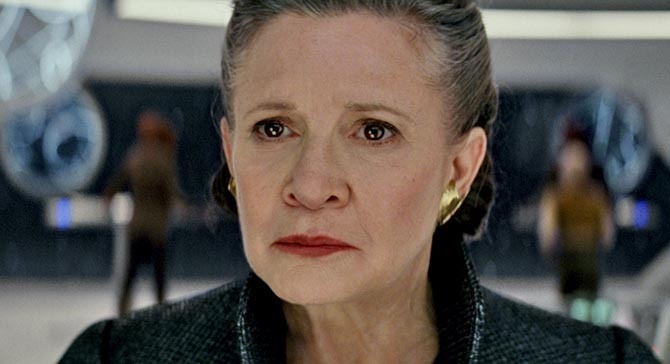 It connects her to General Leia Organa. And well, the way things are left at the dramatic conclusion, where the Rebel Alliance ring is in the very last frame, I have a feeling we will be seeing a lot more jewelry in future Stars Wars movies—if not on Rey, on other characters as symbols of the Resistance, good luck and style.